Some people use their iPhone or iPad for both business and pleasure. In my case, the iPhone is company issued and the iPad is my personal device. Both devices are used to send both personal and business emails. No matter if the iPhone is company issues or personally purchased, you will find yourself sending both business and personal emails from the iOS device. In the past, Apple has realized this and increased the number of email accounts that you can configure on your iOS device. While they added more accounts, they forced you to use a single signature for all of your email accounts. This was bad. 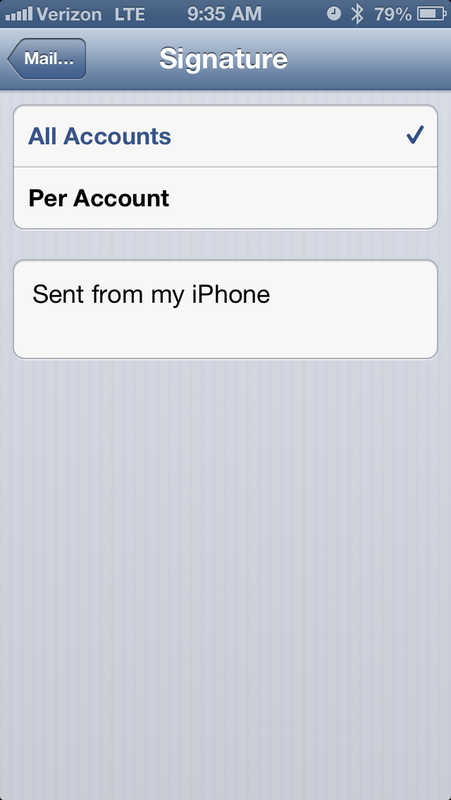 It meant you had to either keep the generic "Sent from my iPhone" signature for all accounts. 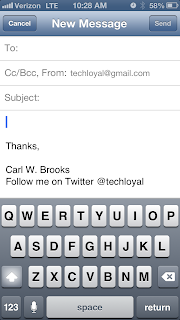 Or type your longest email signature and trim it down each time before you sent your emails to your recipients. I had my iPhone's signature set for work, because it was their device. 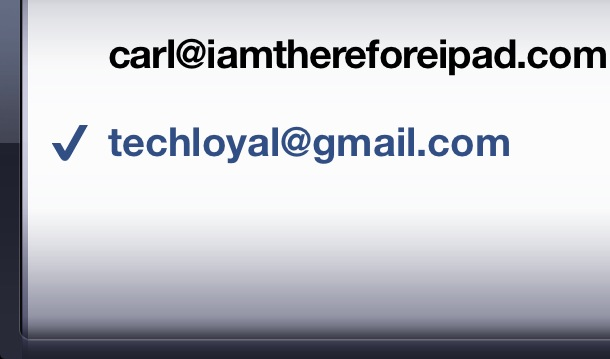 I had my iPad's signature setup for my personal email because it was mine. 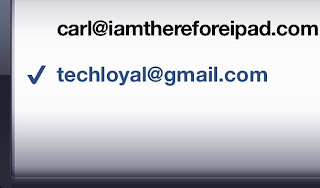 I tried to send all work emails from the iPhone and all personal emails from the iPad, but that plan never succeeded. I would find it was more convenient to send work emails from the bigger screen iPad then the smaller screen iPhone. 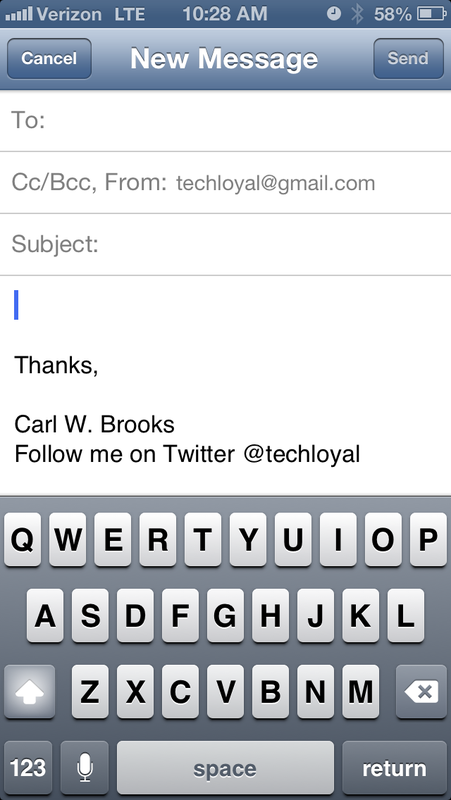 Each time, I would have to delete my personal blog's URL from the signature; leaving only "Thanks, Carl W. Brooks". I didn't always remember. My boss never said anything, but I rather not combine the two. Now my blog is about iPad and the such, but what if it was about a subject many might find objectionable? My oversight could caused potential harm. 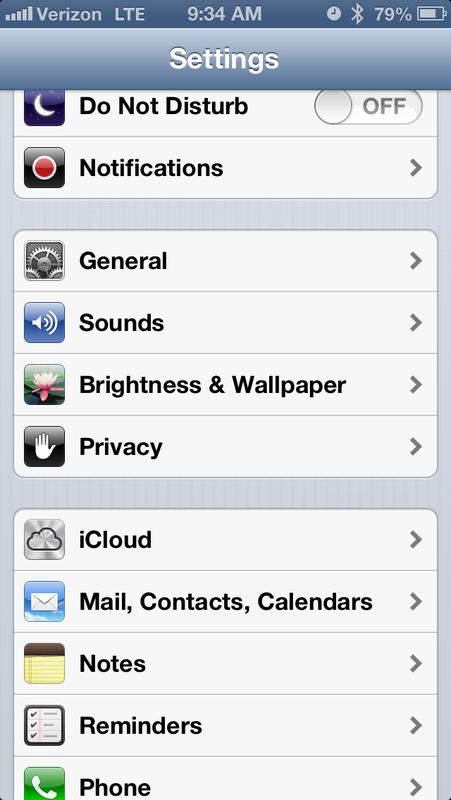 Well iOS 6 fixes all that, but it only can help if you take some time to set it up. 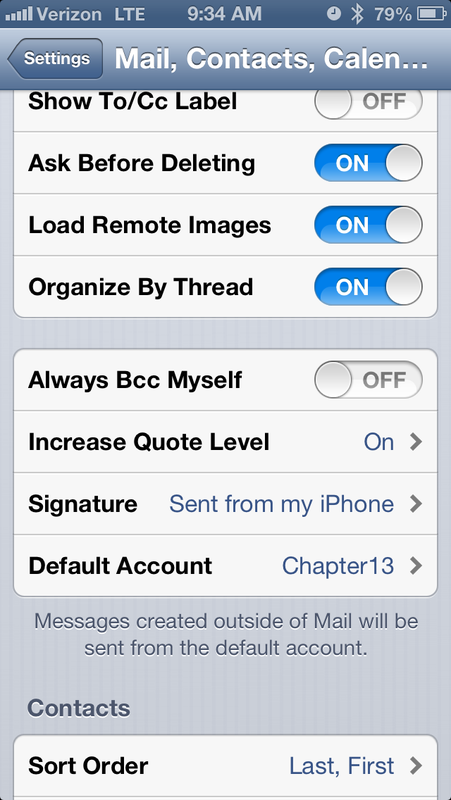 If you have a very long signature that you use, I suggest sending an email from the desktop to one of the accounts you have configured on the iOS device and then copy the selection of text prior to going forward. This will prevent you from having to type it again. So here is a great tip to give you multiple signatures for your iPhone or iPad; and hopefully one less thing to think about. 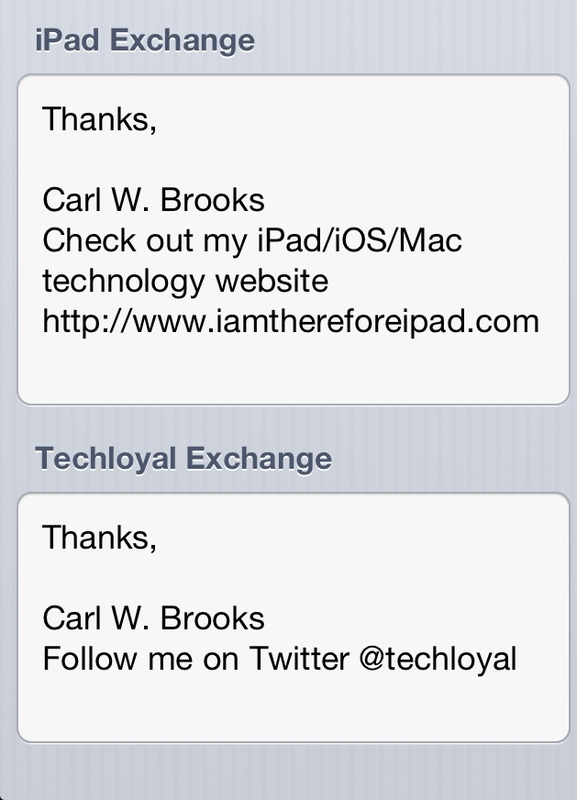 iOS 6 (hopefully you upgraded by now) has added the ability to have a different email signature for each of your email accounts. 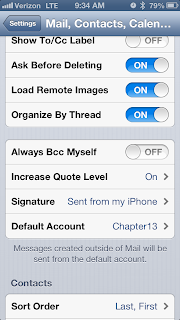 To get started, launch the Settings App and scroll down to the "Mail, Contacts, Calendar" link past the iCloud option. Click the "Mail, Contacts, Calendar" link. 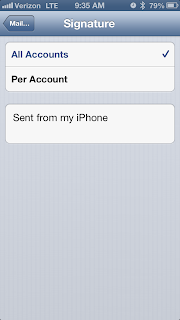 Scroll down and click "Signature"
By Default, "All Accounts" is selected and the default "Sent from my iPhone" signature is active and shown below. Select "Per Account" to toggle the option and display a signature fields for each account you have configured on your device. I have 4 accounts configured, so I have 4 boxes. Type the personal signature you want in each box. 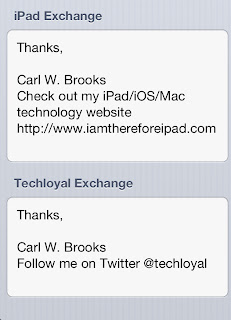 Now your work emails sent from your iPhone can look a professional as they do when you send them from your desktop or laptop. 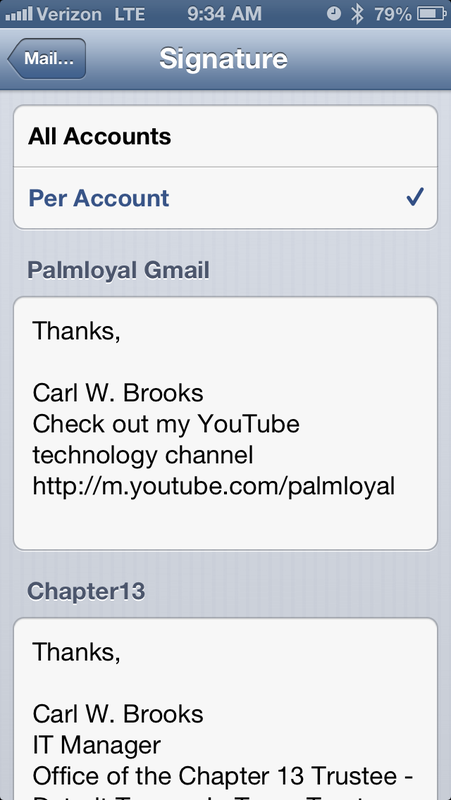 Your personal email addresses can now promote your blog or interests again. 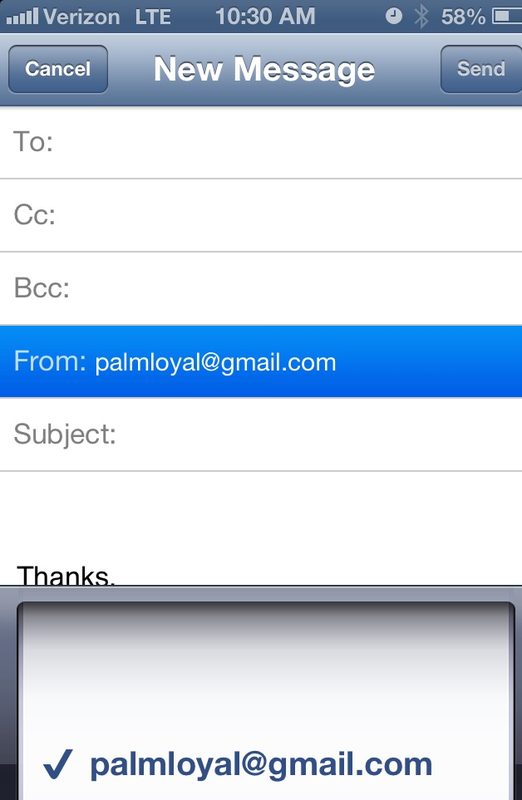 When you select a different email address in the Mail app, by clicking the "From" field, the email addresses will appear. 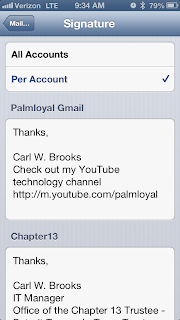 Clicking the appropriate email address, will produce the appropriate signature automatically. If you find this information helpful, please share this story and/or website with others that have an iOS device. Please contribute by adding your thoughts in the comment area below.